There are thousands of reasons to sample a good Iberian ham: its intense flavour, its pleasant texture, its enticing aroma, the sensation it produces on the palate, the way it makes you crave for more... What is more, it is healthy and has become the image of traditional Spanish gastronomy. If you have never tried Iberian ham, you haven't tried ham. Give your palate a gourmet treat and enjoy Iberian ham here in Spain. Spain has delicious gastronomy, and this is even truer if you are eating ham. The mark to look for is Ibérico, an exclusive, top-quality cured meat. Its quality and unmistakable flavour have made Iberian ham into a product that is highly rated outside Spain. Iberian ham goes down well at any time of the day. Mid-morning, served in the most Spanish of styles, as tapas. At lunch, served as a starter, and for dinner, as hors d'oeuvres, it is even ideal for a snack. Scientific studies have shown that Iberian ham helps to reduce levels of bad cholesterol. The excellent quality of Iberian ham is the result of a strict, painstaking production process. This detailed process starts in the fields where the pigs are reared, and reaches its long-awaited finale after being cut and served on the plate. To enjoy its flavour to the full, it should be cut in thin slices, not too long. Ideal to appreciate its colour, feel its texture on the mouth, and to enjoy its flavour. This is why in Spain, cutting of ham is considered an art. Iberian ham comes from the Iberian pig that roams oak forests along the border between Spain and Portugal, and eats only acorns. This landscape, known in Spanish as dehesa (wooded scrublands), is a domesticated woodland, a managed wilderness. Its main living constituent is the holm oak or holly oak, whose acorns, as well as the variegated grasses and aromatic plants that grow around the trees, provide nourishment for the animals that graze here. These are just the most important places where Iberian ham is produced. 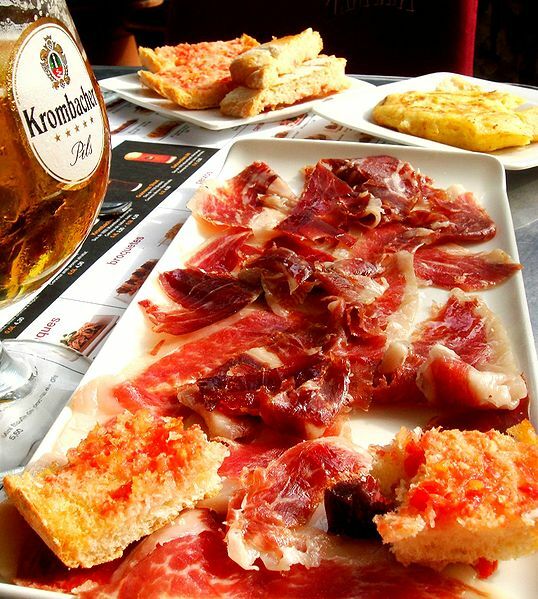 You can sample it all over Spain, because it could well be said that the taste of Iberian ham is the "taste of Spain".